The Polarquest2018 team is launching a series of events today at CERN, aiming to engage people in their extraordinary expedition and describe their scientific accomplishments. Today, Luisa Cifarelli, head of Centro Fermi, will give a public colloquium in CERN’s Main Auditorium: Measuring Cosmic Rays Showers up to the North Pole. She will present the first results from the PolarquEEEst cosmic detector, which took data throughout the expedition on board the sailboat Nanuq. The talk will begin at 4.30pm and will be webcast live for viewers around the world. Non-CERN card holders must register to attend (email polarquest2018@gmail.com). “82°07 North”, an exhibition of photographs taken during the Polarquest expedition, will also open today at CERN. It will feature 33 beautiful photos conveying the spectacular Arctic environment all along Nanuq’s circumnavigation of the Svalbard archipelago, till the edge of the polar ice shelf. “82°07 North” will be inaugurated at 4pm, just before the colloquium, at CERN’s Main Building and will run until 1 October. 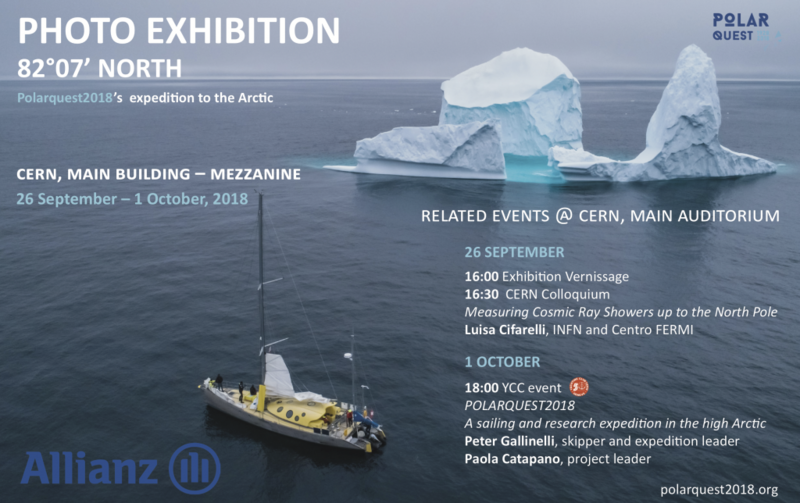 But if you’re unable to attend today’s events, consider joining on 1 October for a presentation on Polarquest’s sailing polar adventure in collaboration with the CERN Yachting Club. Peter Gallinelli, skipper, and Paola Catapano, Polarquest2018 project leader, will tell you about their circumnavigation of the Svalbard archipelago, the research on board about microplastics, industrial pollutants and cosmic rays and the exploration of yet uncharted shores and islands using commercial drones. Other expedition members will be present and available to answer questions. Registration for the event is required. The photography expedition “82°07 North” is sponsored by Allianz Suisse. “82°07 North”: Exhibition and Photo Competition!